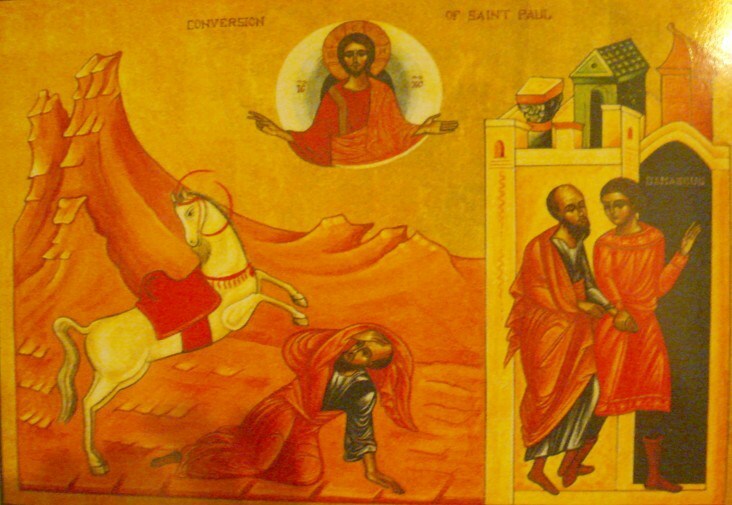 There are many many aspects to the conversion of Saul and the St. Paul comes into being by God’s grace. Let me offer a couple of very incomplete and tentative thoughts on two inter-related aspects of it. God’s timing and our timing along with God’s choosing and our choosing. Am I now seeking the favor of men, or of God? Or am I trying to please men? If I were still pleasing men, I should not be a servant of Christ. For I would have you know, brethren, that the gospel which was preached by me is not man’s gospel. For I did not receive it from man, nor was I taught it, but it came through a revelation of Jesus Christ. and I advanced in Judaism beyond many of my own age among my people, so extremely zealous was I for the traditions of my fathers. nor did I go up to Jerusalem to those who were apostles before me, but I went away into Arabia; and again I returned to Damascus. But I saw none of the other apostles except James the Lord’s brother. Point One: The Christian faith is not about seeking knowledge of God. It is about receiving knowledge of God. That difference is not a matter of semantics. Not a matter of the collegial “well I see it a little differently” diversity. More than a little adjustment of attitude. It is a completely different matrix of reality. We do not grasp truth. We do not find truth. Truth finds us. We pursue humble openness and availability by the leading/drawing of a still small (and often misinterpreted) voice within. No one knows God until God is ready. And, paradoxically, He is always ready. Point Two: When it DOES PLEASE GOD, to reveal Himself, we agree with what is revealed. We repent. We let go of what we had held as true and cleave to what we now know to be true. God’s timing and revelation is always pressing from the outside and the inside of us. But, salvation is not just a matter of God. It is a matter of us too. We have a part to play. Once again a paradox. The paradox is the interplay, synergy, between God’s choosing and our choosing. It needs to be affirmed that the characteristics of Divine choice and human choice differ in quality and quantity. It is not 50/50. Nor is our human choice limitless in influence or outside the arena of contingency. We choose within a context as contrasted with Divine choosing. It seems to me there is a danger to fall into one of two big chasms on either side of the road of paradox. One the one side is the illusion of the autonomy of human choice. On the other is the autonomy of Divine choice in the salvific journey. We can reduce either the Divine or the human aspect of the paradoxical dance of saving volition. It is important us, in the Church, to attempt to correct the over emphasis on human choice in conversion. But, it is also dangerous to do so in such a way as to reduce human choice to something less than what it truly is for the purpose of the correction. It is a narrow road, this road of saving choice. Point Three: We continue in the truth with gratitude. We realize that the revelation is a saving one. “There, but by the grace of God, go I” is a famous proverbial saying. Legitimately, it means that except for the revelation and provision of God’s steadfast love I would suffer the now and to ages of ages torment of my own deluded self’s life-robbing leadings and behavior patterns. There is no line between salvation and sanctification. It is all a matter of salvation. Obedience is walking out in thought, word and deed, with gratitude, the missional fruit of the revelation we have repented into agreement with in union with Christ. Obedience is part of my salvation not just a result of it. Point Four: We do it together. Notice that St. Paul’s desire to assert that his new life was a matter of divine revelation does not exclude human interaction. He attempts to assert both in his reflection on it in Galatians. It is our life in Christ not just my life in Christ. Once again, paradox. Entering into a saving “personal relationship with Christ” is about all of us not just me. And all of this began in God’s timing. All of this continues according to God’s timing. All of this will come to fruition in and according to God’s timing. AND all of this includes our choosing. Nothing in the story of St. Paul’s conversion and his reflection on it is a matter of human passivity or the relegation of human choosing to the sidelines. And, just as importantly, it is not a story of the comprehensive exaltation of the “decision for Christ.” It is all a matter of synergy — union — and the paradoxical character of it. It remains for us to never compromise and live in the paradox. It takes massive amounts of ongoing conversation — conversatio morum. The conversation of salvation in which we dynamically address the extremes with love and appreciation for one another and the mystery in which we find ourselves and live out. I, for my part, refuse to give in to the temptation to solve it one way or the other. I, for my part, desire to live into and out of the paradox and, in so doing, work out my/our salvation with fear and trembling and overwhelming joy and peace. Lets hear it for paradox and the “divine/human/human/created order” conversation of salvation it requires. Our life together is a conversatio morum –a commitment to journey together in the saving dance of conversational salvation. I have blogged on several occasions regarding the burden and joy of language. It seems appropriate, on Epiphany/Theophany, to say something about knowing and making known and what that has to do with language. We are created in the image of God. That means we not only “resemble” God (see 1 John) and are able to be the “in-templed” by God, but God is also able, via the Mystery of union, to express/share/reveal Himself through us (see 2 Corinthians 5). God desires to speak through us and so we are speakers. The aspect that captures my attention this morning is articulation. As I said, mankind speaks, portrays, and explains. But why? What is the drive and what is the goal? God’s design is one thing. Our design might be another. Let’s take the noblest course. We seek to include the other in our own life. We do this by sharing our very life in the form of articulation. Our words and deeds (which include a huge variety of things) are not, primarily, for the purpose of sharing information but of sharing our very self. The goal in this sharing is to find the one and the many who also seek to share their very self. The desire is for a moment and a lifetime of mutuality. In essence we seek to share a common life – commune – “to become one with.” This involves invitation and response. This sharing is essentially relational and not propositional. All of this involves articulation – the real, honest to goodness, use of language. The written, spoken, and acted out forms of articulation offer us the opportunity to do what we were designed to do – remember, share, pass on what is of essential value, and live in a “leaning into the future” kind of way with a specific kind of expectancy. All for the purpose of achieving not just relational but ontological union (without confusion of identities). It means that salvation is not, primarily, about assent to certain propositions. Salvation is a relationship not only with God but with other humans and the whole creation. Salvation, if conversation’s goal is shared life, is about shared life – union – the highest form of assent to the truth! The conversation bears a result or fruit. Notice I do not just the word product or result. Those are mechanical terms. No, the words must be organic. They must speak of the extension and reproduction and reestablishment of life. This is all very risky and requires boundaries as well as inclusivity. Remember that “noblest course” I spoke of earlier? Let’s revisit that for just a second. Articulation and intent can’t be divided. Why do we articulate in all the various ways we do so? Is it to unite or deepen the division? Is it to save or to punish and condemn? These are questions that go to the very heart of our definitions of what we conceive is going on with regard to the saving work of Jesus on the cross. Why does Jesus go to the cross? Is it about the wrath of God or the love of God? The intention of our articulation is another way of saying our intention of relating to one another. Why do we seek to understand and be understood? Is it about wrath or love? Is it about control or reconciliation – moving to the new “place” that provides the opportunity for union? Is it about the reestablishment of relational union? identity/vocation is, in many and varied ways, to make the life-giving Word of God available in an accessible way to people in a life-giving way. It is our highest nobility as persons to do so. He comes up from the water. With Himself He raises up the world. against Himself and His posterity. since He rushes to join One Who is also divine. He is the Savior of our souls. Therefore let us all run to the Jordan! Let us see how John baptizes the sinless brow of One not made by human hands! If we run to the Jordan – say yes to the invitation to endlessly saving conversation, where will it take us? I don’t know and yet I do know. Paradox. Communication is paradoxical. Simply put, it is because communication is for the purpose of understanding. We desire to understand and be understood. And we are persons who seek it. Persons, not formulas and objects. Persons. Language in all of its forms is our way of “putting words on” our need to commune with the “other(s).” But, our need for understanding, if it is to be fully realized, must move into the realm of mystery. If we really desire to understand, we will come to the realization that we will never stop. True understanding is a never ending quest. At one and the same time we understand and yet we know we have understood if we understand there is more to understand about what we have just understood ! ! That is the distinction between mechanical understanding and organic understanding. Saving or transformational understanding does or at least could result in relational union. The Word of God, born once on the level of the flesh, is always born willingly for those who desire it on the level of the spirit, because of his love for men. He becomes an infant, forming himself in them by the virtues; he manifests himself in just the measure of which he knows the one who is receiving him is capable. It is not through any ill-will that he diminishes the manifestation of his own majesty; it is rather that he weighs the capacity of those who desire to see him. And so, though the Word of God is always manifested in the life of those who share in him, yet because the mystery is transcendent, he remains always invisible to all. So, one of the keys to knowing is knowing you don’t fully know and seek to do so and it will take forever. Some have called this the “beginner’s mind.” It is the sweet spot of knowing you don’t know and yet that is how you know. Our knowledge is partial but not statically so. Our knowledge is gaining width, depth, and height (Ephesians 3 and I Corinthians 13). Why? Because it is relational – conversational. Our vow of ongoing conversation – conversatio morum – is essentially our baptismal vow of relational immersion and fidelity in which we are knowable, inviting others in and saying yes to the invitation into the life of others. It is the scariest and the most rewarding aspect of human life. What man knows all the treasures of wisdom and knowledge hidden in Christ and concealed in the poverty of his flesh? Though he was rich, yet for our sake he became poor, so that by his poverty we might become rich. When he made mortality his own and made away with death, he appeared in poverty; but he promised riches, riches that were only deferred – he did not lose riches that were taken way from him. How great is the abundance of his goodness which he hides for those who fear him, which he perfects for those who hope in him! Our knowledge is partial until what is perfect comes. To make us fit to receive this perfection, he who is equal to the Father in the form of God and made like to us in the form of a slave, transforms us to the likeness of God. The only Son of God, made son of man, makes many sons of men sons of God. The slaves, sustained by the visible form of the slave, he frees and makes children so that they may see the form of God. We are God’s children; it does not yet appear what we shall be, but we know that when he appears we shall be like him, for we shall see him as he is. What are those measures of wisdom and knowledge, what are those divine riches, except what is sufficient for us? What is that abundance of goodness, except what fills us? Show us the Father, then, and it is sufficient for us. In one of the psalms someone says to him from among us or within us or for us: I shall be filled when your glory is manifested. He and the Father are one: whoever sees him sees the Father also. So then, he, the Lord of hosts, he is the king of glory. He will bring us back, he will show us his face; and we shall be saved, we shall be filled, he will be sufficient for us. Until this happens, until he shows us what is sufficient for us, until we drink him as the fountain of life and are filled, – until then we are exiles from him and walk by faith, until then we hunger and thirst for justice, and long with a passion beyond words for the beauty of the form of God; – until then, let us celebrate his birth in the form of a slave with humble devotion. We are not yet able to contemplate the fact that he was begotten by the Father before the dawn, but let our minds dwell on the fact that he was born of the Virgin during the hours of night. We do not yet grasp that his name endures before the sun, but let us acknowledge his tent placed in the sun. The genuine “I don’t know,” that is spoken by someone that leans into relational knowing and being known is rare. It is wisdom. It is The Way. The space into which the revelation of the Son of God shines and abides is the heart of the man and woman who knows they do not know and desires to know; the heart of the man and woman who is alone and realizes “it is not good for man (and woman) to be alone” and seeks to no longer be alone but rather to become one again – the reestablishment of relational union not only with God but with others and the whole created order. And this not in some vague philosophical way. No, it must be a union of body and spirit. To know and be known in fullness of being now and ever and to ages of ages. God is communicating. Using language to articulate the inexpressible, Himself. He is the message He speaks. The ultimate articulation of Himself is His sharing of Himself. This is why the Holy Eucharist is normative and essential to our salvation. The conversation of relational union is salvation. Behold the Lamb of God. Behold the Word made flesh. Behold Christ Jesus revealed in and as Love. Behold the other and yourself in the beholding of Christ Jesus in love. The paths of true understanding that arise out all of this are many and intriguing and saving. From very early in the life of the Church Christians have believed that Jesus, who is the Christ, is fully human and fully divine. This was formally defined as a doctrine of the faith during the 3rd Ecumenical Council at Ephesus in the year 431. The Council expressed this belief by giving Mary the Greek title Theotokos, which means: The-One-Who-Gives-Birth-To-God! In English translation this is frequently expressed as: “The Mother of God” or “The God Bearer”. Christmas is proleptic. It draws us forward ever more deeply and completely into itself – His Way, Truth and Life. Our life, if it is a Christmas life, is not our own and yet it becomes truly ours by being a Christmas life. We gain our life by letting go of “my” life. So, the fruitful journey of addressing the question resulted in what follows. Perhaps it will be beneficial as you struggle with that same Christmas question. What good is it to me if Mary gave birth to the Son of God 1400 years ago, and I do not also give birth to the Son of God in my time and in my culture? We are all meant to be mothers of God. God is always needing to be born. I am the Christ-bearer. My life is the address where those who are being invited to come and see the incarnate Christ show up. I am Bethlehem. Wow, what an amazing journey of revelation. God grant me the spirit of joyful repentance to adjust my life so this is more how I live my life in practical ways during 2014.